Why should Tumut players make a three hour trip to the dusty hard grounds of West Wyalong to fulfill their commitments as members of Group 9, when a score or more Rugby League clubs were closer? Even worse was the 185 mile (297 kilometer) Group 20 journey from Batlow in the foothills of the Snowies to Griffith on the edge of the desert. From Wagga to Tumbarumba talked turned to the ‘perfect group’. This, at a minimum would consist of the three Wagga teams, Junee, Gundagai, Tumut, Batlow and Tumbarumba. These disgruntled places believed that the Murrumbidgee Irrigation Area (MIA) clubs dominated Group 20 and the ‘Western Bloc’ of West Wyalong, Barmedman and Temora were all-powerful in Group 9. Numerous submissions for some sort of sensible border realignment had all been rejected by both Groups. When the dissidents were invited to Phillip Street to present their case they were ‘cut off without a hearing’. Their anger became palpable and the breakaway inevitable. Any rebellion would severely weaken Group 9, formed from the most league crazy small towns in the State of NSW. Group President Bruce Maitland of Barmedman saw the talk as simply that burgeoning behometh Wagga again arrogantly asserting its size and power. He judged that dyed in the wool Maher Cups towns like Gundagai and Tumut would never agree. He was mistaken. There were reasons other than geography, travel and the callousness of the authorities that made the MRL an attractive proposition. The transfer fee system had been rankling country clubs for five years. The costs associated with transfers were hurting. Where up to 1959 the Maher Cup towns were importers of class players, they had now been reduced to feeder clubs – sustaining themselves by developing and then exporting their talented youngsters. This in turn lowered the quality of the football played in the small towns. Whereas on one hand a breakaway would mean that the players involved would be blacklisted by the New South Wales Rugby League (NSWRL) and Country Rugby League (CRL), on the other, any imported players would be freed from the transfer system. If you were over the Divide you felt forgotten. According to many country clubs, for the NSWRL the sun rose at Bondi and set over the Blue Mountains, while the CRL, essentially established by Fred Cahill of Young back in 1934, was now beholden to the interests of the Hunter and Illawarra. Meanwhile the VFL and particularly South Melbourne had been pouring money into the southern code in Wagga and other towns, while local League teams had no comparable benefactor. Australian Rules had been increasingly asserting itself as the dominant form of football in Wagga and was threatening Rugby League’s position in the Riverina generally. Wagga saw Group 20 as being run by the Murrumbidgee Irrigation Area (MIA) clubs from which the majority of the teams came. Citizens of the City of Crows suffered apoplexy when the 1965 grand-final between Tumbarumba and Wagga Kangaroos was to be played at distant Narrandera. Jack Weeks the influential writer and administrator from the influential Wagga Daily Advertiser considered that Group 9 was being dictated to by the ‘Western Bloc’ of West Wyalong, Barmedman and Temora, to the detriment of the southeastern teams. While Bruce Maitland thought the strength of the Maher Cup tradition within Group 9 would prevent rebellion, the fiesty and respected Jim Sullivan at The Gundagai Independent (long an opponent of the Maher Cup) stoked the fires of rebellion in the paper, in the pub and in meetings. Anyway by 1965 the Maher Cup, with attendances slipping, was no longer the Holy Grail. Graph of known Maher Cup gates 1950-1971 seasons. No adjustments made for price increases. Rising up against injustice, the first shot was fired in October 1965 by Jack Weeks in the Daily Advertiser where he warned of a possible breakaway. With Groups 9 and 20 rejecting the boundary changes, the CRL invited the discontents to Sydney. However when they arrived at Phillip Street the meeting was promptly closed. The delegates were no longer frustrated and disgruntled, they were angry. Jim Sullivan expressed their feelings thus: ‘anything but a breakaway after such shocking treament from authority, would be nothing but a vivid display of gutlessness’. They did the deed at Gundagai’s Gresham Hotel on 30 January 1966. The MRL unfazed by the threats had a most successful year with famed internationals such as Australian former captain Arthur Summons at Wagga Magpies and Englishman Mike Sullivan at Junee. They even recruited highly talented New Zealand internationals Grahame Kennedy for the Kangaroos and Henry Maxwell at Batlow. If Maher Cup Country had a capital it was Cootamundra. When Coota decided to become the ninth MRL team in 1967 the Cup’s death knell sounded. Only five Maher Cup games were played that year – the fewist since 1922. Without worthwhile opposition West Wyalong won all five cumulating 131 points to 26. The slide continued in 1968 when Young and Harden were lured by the wealthy Queanbeyan Leagues Club to move to Group 8. Again only five Maher Cup games were played, again all won by Wyalong. This time they were even more dominant scoring 144 to 16. Less than 400 people saw the Cup clash between old rivals the Mallee Men and the Barmedman Clydesdales. 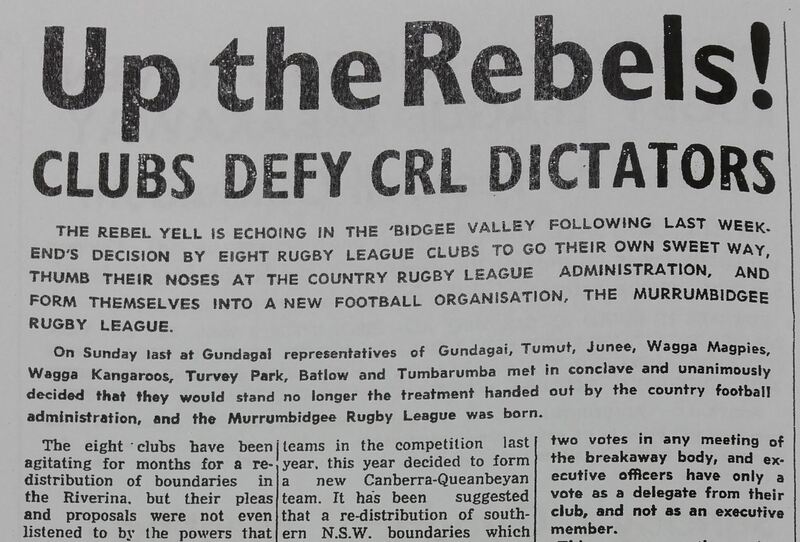 Given that the MRL was motoring along smoothly and enjoying independence, notoriety and good crowds, the CRL finally capitulated in 1969 and the rebels returned to play Maher Cup. Unfamiliar names now populated Cup fixtures – Wagga teams Turvey Park, Magpies, Kangaroos and, forcing punters to look up their AMPOL road maps, Wamoon. The old spirit rekindled briefly when 3,000 crowded into Anzac Park at Gundagai on 7 June 1969 to see the Wagga Kangaroos’ first ever challenge. From then on it was all a mess. The Wagga boys won and then tarnished tradition by forfeiting the challenge by Wamoon, becoming the first club to voluntarily relinquish the Maher Cup. While the Cup was out at Wamoon it was stolen by some Kangaroos vandals who added significant physical damage. Wamoon held it at the end of the 1969 season, but as the village was then transferred back to Group 20, Bruce Maitland went out to the MIA and took his beloved Maher Cup back to Barmedman, for the exclusive use of Group 9 members. Brian Hughes wrote that ‘by 1970 interest in the once famous trophy hit its lowest point’. Only four challenges were made, with a further five as it limped on into 1971. Tumut hadn’t challenged since 1965 and when they did, at Young on the 5th of June there was a feeling that if they won they would probably just keep their ‘Old Time Pot’. As so it was when Young were thrashed 43-4. In 1972 the Group 9 management committee officially retired the Maher Cup to where it had come from. The miracle of the Maher Cup was that it lasted so long. It could be argued that the rebellion, the involvement of the Wagga clubs and of Wamoon hastened its demise, but by the 1970s the Cup simply belonged to an earlier era. An era when little towns like Gundagai, Barmedman and Harden where self-reliant communities, and era when they could by their own efforts make a big impact in the world of Rugby League, and an era when people in small places were beholden to nobody – ironically an era in whose spirit the MRL acted. This entry was posted in Places and tagged Bruce Maitland, Gundagai, Jack Weeks, Maps, Murrumbidgee Rugby League, Wagga, Wamoon. Bookmark the permalink. What a marvelous piece of Rugby League history from country New South Wales.